Peace to you, too, Laura. That is a lovely portrait. I am sure Johanna will be very happy to see your work. Thanks, Sabiscuit! I hope so. I was happy with the way this one turned out. It started out as a quick sketch, and I just kept adding to it. You have a gift, of course, Laura and doing this for a friend makes that gift a blessing. Gorgeous Drawing! You have not only captured a likeness, but the character as well. Thank you so much! I’m really enjoying this face challenge. Getting lots of practice! Exquisitely drawn! You sure have an eye (and skill) for capturing the essence of a being with your sketches. Peace to you, Laura. Thanks so much, Carol! I think drawing daily has really helped a lot. And faces are much easier for me than, say, landscapes…..which you are really rocking, by the way! Wow Laura, that is photo-realistic. You are producing great stuff! Thanks, Kirk! I think practice is paying off. I am feeling more confident approaching almost any face. I’d really like to do pet portraits at some point! Beautiful work. It jumps off the page or screen! Your values are so good in this piece! Thanks so much, Carmel! I totally lost myself in this one. Really appreciate your encouragement. I’m trying to focus more on value. I would know that puppy anywhere! Laura you draw and sketch beautifully, you just make magic! I love seeing what you captured each day! Thank you for sharing your beauty. Thanks so much, Cathe! :)) It’s my pleasure to share, and I thank you so much for stopping by and giving your kind words to me! I really enjoyed drawing her beautiful face. You have captured the heart and soul of Johanna’s Charley. Her eyes tell her whole story. Thanks for posting Laura. Thanks so much, Sharon! Her eyes really are so beautiful and I just love the determination in her gaze. She could teach us humans a whole lot. Thanks again for your kind encouragement, my friend. Love, love, love! You have captured this gorgeous dogs so beautifully. Thanks, Rachel! I find dogs much easier to draw than cats. Not sure why, as I haven’t owned a dog in many moons, always had cats. It was really so nice to spend time with Charley last night. I know the word “love” gets a bit over used these days but, Laura, I LOVE this drawing!! What a face. Excellent job. He obviously inspired you. Thanks, Susan! She really did. What a beautiful gaze and I love the emotions she conveys in all of those photos. There are so many great ones at that link. Really glad you enjoyed this so much! Thanks so much, Rebecca! I was pleased with this one. I kind of wish I had done it on non-spiral bound paper but I never know how they’ll turn out going in. Glad you like it! This looks great! Very well done! Wow wow wow! This is absolutely amazing, Laura! 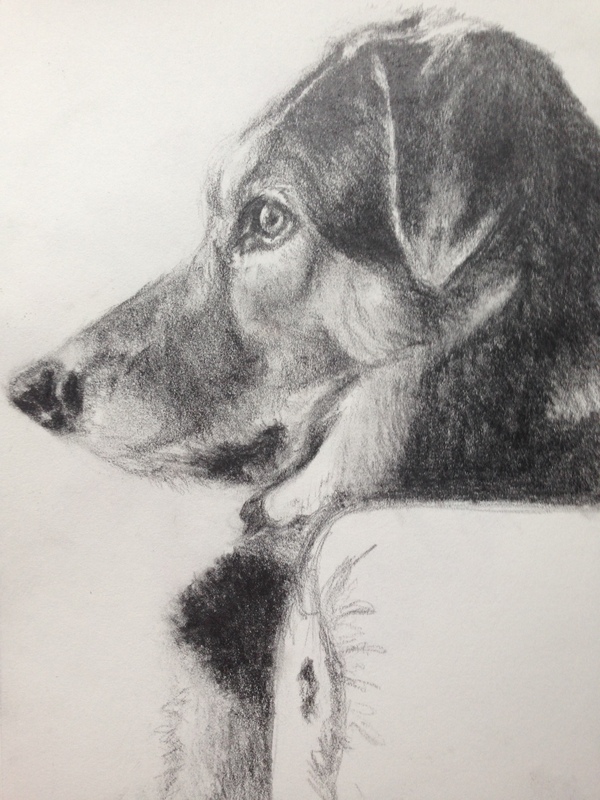 Stately is such a great word and you’ve certainly sketched a stately dog – wonderful stuff! Oh that’s very sweet! If mine rock, yours *totally* rock. They should form a band! lol! 😀 They should! But seriously, though….yours are terrific, Jacob. It is a beautiful, beautiful portrait of a gorgeous dog, Laura! Thank you so much! I really enjoy drawing dogs best, I think! She really does have a regal bearing. So glad you enjoyed this! Meg, thank you very much. That is a huge compliment. When I look into the eyes of a creature and can connect with it, I do think it can be a transportive experience. With this piece, I had more time than I normally do to work on a picture (I don’t like to come back and work on something over days or weeks; not sure how people have the patience for that). I think that really makes a big difference. The face challenge is helping me to see that maybe faces are what I’m *meant* to do. I love anything that is alive, even flowers and trees, the ocean, etc. I really appreciate your feedback & encouragement! My gosh, Laura, your drawing is awesome. So much character in the face. Beautiful job on this face Laura. Thanks, Kerfe. I’m glad you like it! This is stunning as a drawing – bet it would make a beautiful oil, as well…. Maybe, if someone like you painted it! Thanks, Nexi! I don’t know how can I missed this post! What lovely portrait 😍😍 Super awesome work Laura! Thanks, Snehal! Oh this dog was a dream to draw. What a beautiful creature she is! So glad you like it!! This is a marvellous drawing! Thanks so much, Maggie. I really enjoyed this one and spending time drawing this dog was wonderful. An amazing dog portrait – amazing execution and bringing this beautiful animal alive on our screens. Thanks, Mary! Oh this one was a joy. I’m so glad to get your kind feedback. Have a terrific week! You have the ability to convey and capture the spirit in your portraits – it’s wonderful to see your work. Have a great week! (((((Mary))))) You too, my friend! Laura, you do amazing portraits of dogs. This one is WOW! just wow! Thanks so much, Rachel! I was pretty happy with this one. So glad you stopped by! Thanks so much, Debi! This one was such a joy. I became totally wrapped up in capturing her. I love that trancelike state. Nothing beats it. Thanks so much for stopping by and encouraging me, my friend! Thanks, Donna! I kind of went into a trance with this one. Really enjoyed it, it was like a long soak in a tub. What a beautiful subject! Really glad you enjoyed this one. Thank you so much! She was a pleasure to draw! OH MY GOODNESS!!!! I am away for a few days….and look what I find on your blog!!! I am moved to tears Laura, this is Charley in every sense of the word!!! It makes me very happy and THANKYOUTHANKYOUTHANKYOU!!! Laura do you sell your work? xoxoxox with a big hug from Charlie too! Dear laura, could you email me at colorpencil.2014@gmail.com and tell me more about sizes and prices? No hurry, whenever you have time! Johanna, I’m so flattered to be asked this question. I will have to think about it, because I’ve never really sold my work before. I assume you’re interested in a graphite piece, similar to this one? Same pose OK? I would love to take another shot at this and really try and do it “right” as they say. I did this one in front of the TV set! I have no idea what size you might be interested in. I will email all of this to you as well. Thanks again! I’m so glad you like this! I really enjoyed drawing your girl. I sent you an email too. Sounds great! Very flattered. Thank you, Johanna. You and Charley & family have a great weekend! Hi Johanna, Maybe I goofed and left the period out. Sure, my email is createarteveryday@comcast(dot)net. Thank you again! Thanks Laura, I will send an email later today or tomorrow. with a hug from Charley too!!! Hug Charley back for me! This drawing is the most liked on my blog ever, and that’s mostly because she is so gorgeous and you take wonderful photos! Thank you! She was a real pleasure to try and capture on the page. Thanks so much, Margaret. I’m really proud of this one. When I take several hours to make something (which hardly ever happens), usually it turns out pretty well. This animal was so beautiful which really helped! So glad you liked it! Laura I know that feeling, you are compelled to follow the inspiration of that captivating image and you must sketch. What a gorgeous dog. When you follow those creative urges, we can see it in your work. Simply beautiful. Thank you so much. I was so thrilled at Johanna’s reaction to this one. You are so right about that fire and inspiration. We really MUST follow it! Thank you kindly for your visit & comment. That is a lovely drawing! Thanks so much! She is a wonderful animal to draw. So stately! This is a beautiful drawing. I admire your talent! Thank you so much! I draw regularly, could never draw before, even after four years of high school art. Turns out it’s all about practice. If you have the desire to draw, please practice daily and you’ll be rolling along in no time. Ten minutes a day. “Drawing on the Right Side of the Brain” is an amazing book. Everyone can draw. If I can, anyone can. Really glad you enjoyed this drawing. What pencils do you recommend? I take it back – it’s 200 pages, 100 sheets. It’s what got me drawing daily as you can date your work to track your progress and it’s so inexpensive that you won’t mind tackling anything that calls you! Which is key. Good luck! !